As seen here, on Out Of Print. Our son gave me Jim Henson: The Biography for Christmas, and I've been tucking into it over the last while. I've been learning a lot about Henson, who coined the word "muppet" many years before either Sesame Street or The Muppet Show. He actually had worked out the concept for that series more than a decade before it finally made its way to air, with sketches for an opening that look remarkably similar to the "it's time to meet the Muppets" theme that we all know. Henson started performing the Muppets in slots on local TV in Washington, and caused enough of a buzz (no pun intended) that he was approached by a regional coffee distributor, Wilkins Coffee, to make TV commercials. Each spot was short - just 10 seconds, which meant that Henson and his partner and future wife, Jane, had to come up with eye-catching moments. The jokes are blunt, and Henson deployed techniques to get a laugh that future Muppet Show audiences would love. The ads worked so well that Henson was asked to replicate the formula for other regional companies. For many, the ads were the first time anyone had seen the puppets, or heard the voice of Henson, who by this point was only 21 years old. I was curious to see if the ads are available online. Sure enough, they are ... all rounded up in one place, too. From Brainpickings, a true Christmas treat. "Well-meaning adults can easily destroy a child's love of reading: stop them reading what they enjoy, or give them worthy-but-dull books that you like, the 21st-century equivalents of Victorian 'improving' literature. You'll wind up with a generation convinced that reading is uncool and worse, unpleasant." This is an excerpt from an essay by Neil Gaiman on why libraries matter and such things; it includes an argument on why parents should avoid interfering too much in the reading preferences of their children, and let them pursue what they want rather than eliminating choices (like comic books) and prescribing what they think is important. You can read the whole of it here. "A novel is a mirror walking down a road." "We take to fiction, I suppose, because no such thing is going to happen, and at least on the printed page we can observe beginnings, middles and ends, and can find out where morality resides." This is one of a series of creatives for a Brazilian campaign aimed to get people to make good use of their old books. "Don't throw out your books," it implores. "Donate them." You wouldn't want to make Pinocchio homeless, would you? "It’s no good pretending that any relationship has a future if your record collections disagree violently or if your favorite films wouldn’t even speak to each other if they met at a party." This ad is part of a wider literacy campaign from a few years ago that revolved around the tag line, "When a child doesn't read, imagination disappears." Ideas nourish the brain and the spirit as much as food nourishes our cells. "What you read when you don’t have to determines what you will be when you can’t help it." One of the podcasts I like listening to while I make coffee and putter about the house is Alec Baldwin's Here's the Thing, which is produced by WNYC in New York. The show is an extended chat with a notable person, often someone in entertainment, with often insightful results; Baldwin, it turns out, has a knack for conversation. Last night, I listened to the latest show, with Andrew McCarthy - yes, the Andrew McCarthy who was in movies like St. Elmo's Fire and who is still best known as being a member of the so-called Rat Pack of Eighties movie stars. And since then, he ... well, I had no idea. I like hearing interviews of people whose work I know well, but I also like being surprised, and finding something interesting in something I had never (to be frank) cared much about. Out now from self-described micro-press Running The Goat is a new Jack story by Andy Jones, who has been collecting and telling them now for a few decades. Jack and Mary in the Land of Thieves features illustrations by Darka Erelji, and it's on my list. Here's a collector's item I learned about, like the author of the piece: an edition from three decades ago of Robert Crumb's (or, R. Crumb's, if credibility really, really matters to you) sketchbooks from his truckin' prime. "Thank you, phone books, for combining the two things that no one answers or reads anymore." 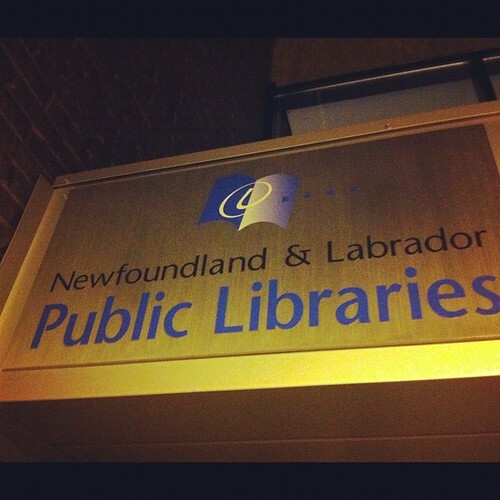 I got a pleasant surprise last night when I logged on to the e-library that the Newfoundland and Labrador Public Libraries offers. I've been finding the e-book service quite useful, and indeed have been reading more, and more widely, since I installed it. Learning I had room for two extra titles was a gift. "Children want to do what the grownups do. Children should learn that reading is pleasure, not just something that teachers make you do in school." "The Nobel prize is a fairytale for a week and a nightmare for a year." The above quote from the 2010 laureate appeared in this article published Friday in The Guardian. This cracked me up: a library book about passive-aggression, with all of the pages removed. I'm sure there's a story there!